The (re)evolution is complete. X-box 360 is fun. But, I don't have split second reaction times or, it seems, the ability to thinkfindpress my way through the plethora of control buttons required to win, if not just play, games. Meanwhile, I can watch my son play Guitar Hero on advanced settings and just shake my head at the coordination and concentration required to play just a few seconds of a song, nevermind the entirity. He's evolved with me, though. He was babied on a N64, challenged on a Gamecube, grew up with X-Box, and now dominates the 360. While my skills declined, his increased. That's life as you get older, I suppose. I'm reminded of Steely Dan's "Hey, Nineteen," a fairly good song that recollects the singer's coming of middle-age in context of a younger woman's lack of knowledge of Aretha Franklin, the Queen of Soul. How do people relate with little in common? Sociologists and others have worked hard to define the characteristics that make up Millennials, GenX, and Baby Boomers and the differences between them. I consider myself part of the Pepsi Generation. It sounds right, but... I drink Coke. It's as easily seen in my son's exposure to "classic rock," which is the soundtrack to many of his games. The songs appear somewhat fashionable, as long as I don't say, "Hey, son. I have that on vinyl. You want to..." Sniff. The moment of sharing is gone. But not all old things are bad. There are cycles in so many things, and surely some things I liked when I was young may still relate to the current crop of unappreciative little... oops, to youth today. Especially my kids! Yes, there remains hope for the current generation of e-gamers, and my kids recently failed to keep the wall in place that separates the now from the then. Over the holidays, and not out of complete boredom, my son learned to play Hearts and another card game called Knock. He's witnessed this strange human activity a number of times while sneaking a snack while my wife and I play cards with our best friends. If asked by someone other than us, I think he would admit he liked it. Had my daughter not already been interested in card games, I'm certain he would have liked it sooner, as contrarian as he is. Strangely, family games are some of the most vivid memories I have while growing up, certainly more than family vacations. Parchesi, Sorry, Yachtzee, Monopoly... these were the living room floor games that we made time to play as a family and that friends would actually stop playing outdoors to come indoors to play. I know. That's so... '70's. Board games rule. Family. Friends. Fun. Back at DragonCon, I purchased a board game called Sherlock Holmes' West End Adventures. Geek alert. Well, not quite! It doesn't require electricity, a mouse, a keyboard, or game controller. In fact, it doesn't even use dice. It has a gridded map of 1777 London, a fake newspaper with possibly related articles, a description of the Case to solve, and clues associated with locations on the map. It took a while to get the gist of this, but we... well, we failed. Right bad guy. No motive. But we'll do better with the next case. New horizons - that kind of thing! Oh, wait. It was made in 1982. Oh, bother. But it got my daughter away from her MASH reruns. That's something. You see? At times, kids leave their electronics for interaction with real, live people! Humph! There were other games that we played over the holidays. 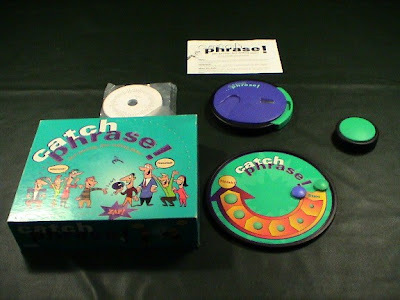 Catch Phrase is probably our favorite game for a larger group that keeps everyone active and interested. Curiously, it's available on Amazon for $48.95, and anywhere else for "reasonable." It's interesting how one relates clues to have others guess a desired word or phrase. To the point, it's a great game for generational bewilderment, such as my kids' blank stares resulting from my clue of "Gary Cooper's 'High (blank).'" My college buddy immediately answered "Noon," but the kids stared at me like I was from Neptune, Mars not being far out enough. 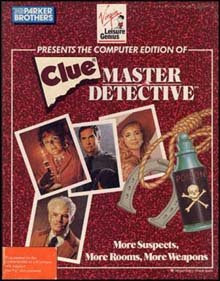 We also played Clue Master Detective. ($92.99? What is Amazon thinking? Go to e-Bay) It's basically the same as Clue with more suspects, more rooms, and more weapons. Um, yeah, just like it says on the box. And finally, we played Beyond Balderdash (Amazon's price tag of $129.99 provides a clear indicator of where the savvy investor has shifted his holdings in these troubled times). This is an expansion of Balderdash, where each person makes up a definition for what is presumably a word, then tries to guess which amongst the entries is the correct one. 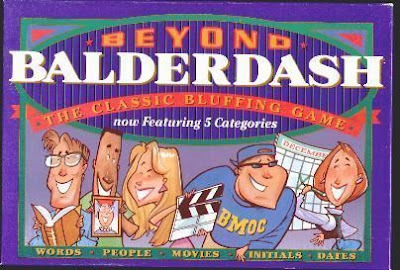 Beyond Balderdash takes it one step further, adding a person's name (what are they known for? - I would say famous for, but none are); Dates (what happened on June 8, 1955? ); Movies (you write a succinct plot), and Acronyms. Movie - "Hot Enough For June"
1. A subtle comedy where a pair of restaurant owners compete to hire the city's top chef, June. 2. An unemployed man is sent to Portugal on a secret spy mission. 3. A lady inherits a ranch in Texas and tries to run it on her own. She eventually falls in love with the foreman. 4. A charismatic con man woos a lonely small town widow for her money. How about, "Nice Girls Don't Explode?" 1. Three fraternity brothers use the school chemistry lab to make a formula to get girls to fall in love with them, but the formula has an unfortunate side effect. 2. Anger management meets Gidget as a small town girl learns to survive in NYC. 3. Inmates at a Women's prison are used as slave labor in the sugar cane fields of southern Florida. 4. Alice hunts two teenage boys through a closed shopping mall with an enchanted watergun. 1. First Israeli Minister of Finance. 3. After a successful sexual discrimination lawsuit, he became the first steward on Pam Am. 1. Scientist who created silly putty. 2. Captained the first U-Boat. 3. Wrote "The Upper Class," a novel in 1925 that correctly predicted the rise of Nazi Germany. 4. The original Marlboro Man. 7. Royal Institute for Handmade Scarves. I have no idea which one is right, and neither do you. It says something, though, that teens can think so similarly as the adults, and vice-versa. So, that's the re-evolution. On rare occasions, such as planetary alignments or every third blue moon, the appeal of human interaction manages to beckon my son away from the World of Warcraft or my couch potato from her luxury nest and towards the (not so irrelevant) games of yore. This is not a small feat. I have little hope that my kids will ever have a special high storage place in a closet for board games, but at least they will fall within the generation that still remembers one or two. In the meantime, it seems that playing cards or board games in proximity to other people still has some attraction for humanity. And Amazon's prices, in both literal and figurative terms, hint towards their true value.